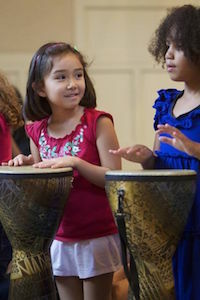 Rhythm Kids™ Level I: Drumming based curriculum for 4 and 5 year olds to attend along with a grown-up. Rhythm Kids Level 2: Interactive drumming for kids! Created for children in kindergarten through second grade. Rhythm Kids follows through on the Music Together® vision to help children complete the pathway of early childhood music development from birth through age eight. A special part of the Rhythm Kids class experience is the play-along videos and other materials available online. With the help of a grownup, as needed, children can have drumming play and practice sessions with Rhythm Kids creator Tom Foote himself!